I hate it when a bank assigns me a PIN number for my bank card. I never have a really good way of remembering it apart from writing it on a tiny piece of paper and hiding it in my wallet. It seems like they do this so that I don’t pick something obvious but really it’s much worse. Ninja Biff! AWESOME! You need to make a shirt of that. Heh… I used to be paranoid with my PIN number… until I ended up using the same pin number for my ATM, password recoveries, voicemail, etcetera… now I’m not so paranoid (until someone asks me to *change* my PIN… becuase I’ll never remember it). Makes me wonder what a Frosted Bra is…. You better also note the phonenumber to lock that card of yours. I thought by law, you are allowed to change your pin to whatever you wanted? Then again, all the banks I ever used always let me choose my pin. What are those hair things sticking out of Biff’s shopping bag? @Dragoon – Yeah, you are, just like how most sites let you change your password. And, just like your password, many places will suggest you do it often, like every other month if it’s really important. Something I try and do with passwords is use other languages. I pick a word relevant to what the account is for, like maybe choosing sword or shield for an MMO, then I look up all the different ways that word is said/written in different languages. @Jippen – about 90% of the people I know call it a pin number. My parents and grandparents never correct themselves when they call it that. Hell, when I first made my bank account, the person helping me called it a pin number, as do every teller in every bank I’ve used since then. I remember my PINs by shape. My dad uses mnemonics based on simple equations. My mom just uses her birthday. The majority of people using things with PIN say PIN number. I’ve told folks to do the ‘pattern’ thing that Edem mentioned above, but I take it one step further and write FAKE PIN’s on the back of all my cards. A Theif looks at it, plugs it in and the ATM steals the card back for me. Backronyms are even funnier than acronyms. My PIN used to be the exp requirement for level 70 on WoW minus the zeros (it was easy to remember because that number would mock me for two hours a day) but my bank brought in some policy about not having the same number twice or consecutive numbers in PINs so it got changed. Now I remember it by the years my two favorite albums were released. 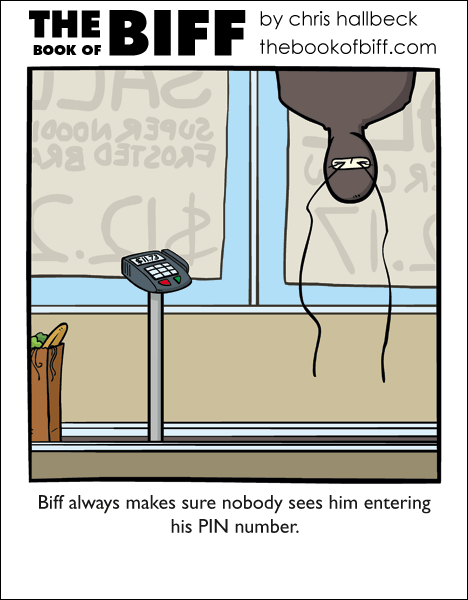 Biff, the PIN ninja. The PINja! I want to know where he shops. Looks like a full bag of groceries for $11.73! My first debit card came with a fairly easy to remember pin number. So I’ve just kept using it. Because if I change it now I’ll never remember it. I know I’ve seen 11.73 somewhere. Simpsons checkout scene in intro? Ha, I just got a new card and also resorted to writing down the pin in a “secret” place. Is that black spaghetti squid ink pasta? I realized I can remember numbers of about 8 digits by the movement may hand makes when typing it, so all I do is make an easy to remember movement. speearr- I’m betting it’s the Super Noodle Frosted Bran Flakes we saw earlier in the week. Kurast – Yeah, I’ve heard all of those. And it drives me insane, every time I do. Then again, I have enough pet peeves to start a petting zoo. @speearr: I’m guessing Frosted Bra is the “Super Noodle Frosted Bran” — This explains why Biff chose this location for car shopping — supersales! Heck, while Biff’s at it, skip the pin and ninja the groceries away. No one will know.. Except maybe us. We’ll know. But I’ll never tell them Biff! YES, I knew Ninja-Biff would make his debut! I think it’s called RAS Syndrome, which in itself is a victim of Redundant Acronym Syndrome Syndrome. @ Kurast – What about things that aren’t even abbreviations, just mixing of languages? Like The La Brea Tar Pits (The The Tar Tar Pits). The Sahara Desert (The Desert Desert). I like Ninja Biff. Haha. Hide your pin number in a phone number named after a common name none of your friends have, like hank, or bud or something like that. You can enter the pin in the last 4 digits for example. No one will know which number has your pin hidden in it. Good luck! I’m wondering more why the SNFB is $12 a box. spider biff, spider biff, does whatever a spider biff does. can he swing from a web? no he cant he’s a biff. lookout! here comes spider biff!!!! I have my own theory of Biff, it stems from the story of my game (which I made before I knew about this site (well the “story” of it, I am still working on the game itself)), which Biff happens to fit into a certain part of it almost perfectly! Yes, Biff has made himself a home away from home at the grocery… Spare underwear, showering facilities and swapped out the towel for extreme anonymity of ninja. Go Biff. Am wondering if he is floating in the air to punch in his PIN or this store has extremely low ceilings?! Good salad choice though, romaine lettuce? Oh, just remembered somehting awesome. My friend has the best password for the school computers. He takes a regular word, and types it in one row up on the keyboard. I was amazed when i learned that. While I find “PIN number” annoying, I feel just “PIN” could be confusing(pen? ), especially when everybody knows it as “PIN number”. THEREFORE, I always call it a “PIN code”. I call it anything from a PIN to a number thingy which you put into an ATM devicey thing. I’m tired a lot, ok? Also, I’ve completely forgotten the PIN for my Debit card…. This is not a good thing. I usually remember by thinking backwards. “Everybody does it” is a piss-poor excuse for doing something wrong. Master your bad habits or your bad habits will master you. [this number removed by the committee of not being a bloody idiot] is too easy to recognize when you’re typing it. On the other hand, it gives my an opportunity to share this link I found yesterday. Let’s hope the story remains fictional and we don’t all have PINNNs one day. You know, I think everywhere lets you do this… and it seems obvious to me… but, couldn’t ya have just changed your PIN Chris?? *shrug* ah well. @weerd2nrml – above that it says “Super Noodl”, so I would bet it means “Super Noodle Frosted Bran”, from the earlier comic in frugal week hehe. Remember only where your Hand moves and make it an Image. The Human Brain can parse an Image thousands of Times better than a Number. Until you have that special Sort of Autism where Numbers have a Sound in your Head, but then it’s the Melody anyway. Remembering my PIN is easy. Changing it to be secure is hard. Ninja Biff, the master of eating spagetti in a blink of an eye, and vanishing into a bowl of mashed potatoes….what, I can’t come up with something clever. For my phone PIN number, I look on my sim card and use the first 4 numbers!